Lahsun ki chutney is widely used in many snacks and also accompanied with many snacks. Lahsun means Garlic. Its a spicy chutney and goes well with snacks . Though it is now sidely used all over india, it has its roots in Rajasthan. This chutney is these days available in grocery stores too in ready to use packets. This chutney is prepared either dry or moist liquid form depending upon the cuisine which goes with it. But both the forms can be stored for upto 1 month if refrigerated. Here, I am posting the liquid form of Lahsun chutney. Shelflife: 1 month (if refrigerated). 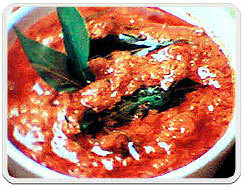 Note: Use good quality of red chillies which gives colour and spiceness as well for a perfect blend of colour and taste. Wow, Very nice chutney. I'll give it a try.